The economy may not be recovering fast enough in what's been a tumultuous election year, but Amazon (AMZN), like other retail competitors, is on a hiring spree for the holiday season. In fact, it's looking to add new workers by the thousand. The online retailer announced it's looking to bring in new temporary workers to three of its "Fulfillment Services Centers" in Las Vegas, Nev., and in Lexington and Campbellsville, Ky. The Las Vegas center will add "hundreds" of new jobs, while the two fulfillment centers in Kentucky will each add "thousands" of seasonal workers. Specific positions available -- for those who are able to stand, walk and lift on a regular basis -- include full-time and part-time roles in "Picking, Packing and Receiving/Shipping." "We are looking to hire smart, friendly and dedicated people to help us deliver a great experience for our customers during this holiday season," Amazon's VP of North America Operations Dave Clark said in each of the accompanying statements announcing the hirings at all three locations. "We focus on working hard, having fun and making history at all of our facilities across the United States." An Amazon spokesperson did not respond to a request for comment, but it doesn't appear that Amazon -- at least officially -- has previously looked to hire so many people on a temporary basis. Certainly, it can afford to do so, based on a string of quarters with sizable revenue (even if that most recent quarter overshadowed news of a hefty tax bill). 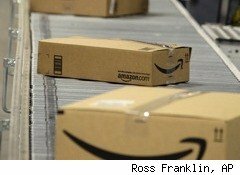 Amazon's hiring initiative mirrors the efforts of Toys 'R Us, which is hiring 45,000 seasonal workers for its 600 stores; Kohl's (KSS), which will add another 40,000 workers to its temporary payroll; and many other companies that are bringing in more new seasonal employees than they have in years. Overall, the Associated Press reported that retailers will add between 550,000 and 650,000 jobs this holiday season, the most since 2007.